The heirs to a popular chain of couples’ hotels are planning to redevelop one of their Miami properties into a 96-unit apartment building, signaling the continuing attraction of multifamily investments in the city’s outer neighborhoods. 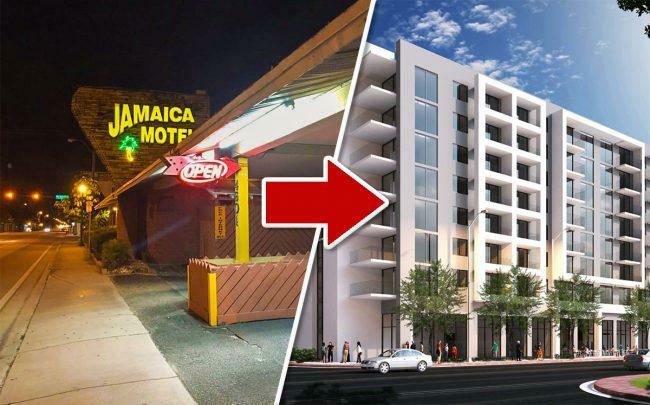 Applicants Julio del Rey, Jr. and Jorge del Rey filed plans with the city of Miami last week to build an eight-story multifamily project on the site of the Jamaica Motel at 4601 Southwest 8th Street between 47th and 46th avenues. The two developers are the sons of Julio del Rey, Sr., who bought the Jamaica in 1995, records show. He is the proprietor of Executive Fantasy, a line of hotels that offer guests short-term stays, including hourly, in rooms equipped with Jacuzzis and private driveways. Some of the hotels are referred to as “love hotels” on the company’s website. Miami has seen hundreds of new rental units enter the pipeline this cycle, many clustered downtown, in Brickell, Little Havana and Flagami, like developer Robert Suris’s 330-unit Soleste Blue Lagoon on Northwest 7th Street, set to open this year. Meanwhile, the rental supply along the western stretch of “Calle Ocho” has remained thin, which the del Rey family hopes will put them in a prime position. Aside from the Jamaica, the del Reys also own the Executive Tropic Garden and the Executive Grand Emperor, both further out along Southwest 8th Street. They said they have no plans to redevelop any of their other hotel properties right now. The two developers are the brothers of Miami-Dade Circuit Court Judge Marcia del Rey, who was elected to office in 2016. The brothers said the judge does not have an ownership stake or financial stake in the property, nor in its development.